Bunyip is a town in Gippsland, Victoria, Australia, 77 km east from Melbourne's central business district. Its Local Government Area is the Shire of Cardinia. At the 2011 Census, Bunyip had a population of 2,232. Bunyip is named after a creature found in Australian Aboriginal mythology. Located on a hill some 44 metres above sea-level, a township was established here alongside the Bairnsdale railway line when it arrived in 1877. Surrounded by swamp as it was, one can attribute the foundation of the town to the railway line and the elevated terrain itself. The Post Office opened around November 1877 and was known as Bunyip R. S.until 1903. The Kooweerup Swamp comprised a region of some 6,000 acres (24 km2) stretching from Sawtell's Inlet on Westernport Bay to the township of Bunyip in the north-east. The Swamp was formed by waters of many rivers that flowed down from the surrounding high country to make impenetrable swamp lands. The first settlers had great difficulty in cultivating the land because of the impenetrable walls of giant ti-tree, large gum and blackwood trees which lay under the surface. The first European person to attempt to cross the Swamp is thought to be explorer William Hovel in 1827, he found the scrub to be an impenetrable wilderness but was impressed with the quality of the country. A number of private attempts were made at drainage works in the 1860s and 70s but they were met with little success. In 1847, a road was surveyed through virgin forest to "Bunyeep" which enabled travellers to follow a track that led further east into Gippsland. The survey showed a building 'Andersons' at the future site of Bunyip. In December 1857 a township site was surveyed with Messrs. Connor, Vale and McKinnon purchasing most allotments, this site was between the Bunyip River and the present Ellis Road. Connor built the old "Buneep Hotel" around 1858 to accommodate coach travellers on the route between Melbourne and Sale, this was a journey that usually took 36 hours. In 1859, a new road, later known as the Old Telegraph Road was surveyed in an attempt to avoid the bad conditions of the old route to Sale. In 1860 there were further improvements made for coach traffic with the opening of the Old Sale Road three miles (5 km) to the south of "Buneep Village". In 1867 Connor selected land to build the "Bunyip Hotel" on the west side of the Bunyip River along the new road, the licensee was David Devaney. The new hotel had 14 rooms as well as a 25 stall stable. Before settlement could really be established at the new Bunyip site, the railway line from Oakleigh reached the "Bunyip Bank" in October 1877, by March 1878 the Bunyip to Moe section of the railway line was completed. A track from the new Bunyip site was constructed to the third and present township site. 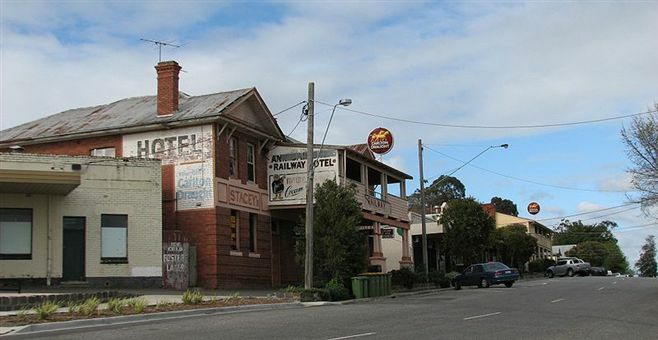 Two hotels, the Butcher's Arms and the "Bunyip" were set up in 1876 while the railway line was under construction. John O'Brien was the licensee of the "Railway Family" hotel in 1877. The establishment of these hotels was permanent. The main outlet for the men looking for work was in the timber industry and local splitters were fully employed having orders to keep them in work for many months. Large eucalyptus trees were selected and were then sawn with a cross cut saw into required lengths. Palings were used for weatherboards, garden fences and roof shingling. In 1887, in addition to the two hotels there was also a general store, three or four dwellings and a state school. It took another year for speculators to arrive in the district looking for land, it was about this time that development started on the large swamp area land nearby. 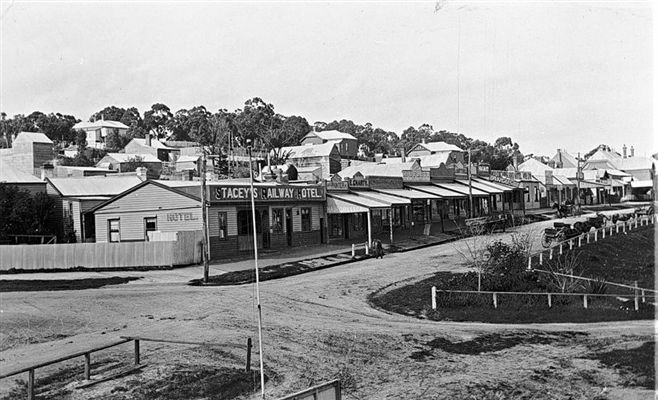 The township of Bunyip grew slowly in its early years, but by the turn of the century there were more businesses than houses, these served the people in surrounding districts as well as locals.